What does it mean to be a Puerto Rican scientist? What makes science Puerto Rican? The question reminded me of another conversation I had years earlier regarding Puerto Rican cuisine. A friend, who was returning from a trip to Italy, said he had discovered on his journey that there was no such thing as Puerto Rican cuisine. "In Italian cuisine you've got dishes like pasta or pizza, that you can only find there," my friend told me. "In ours, everything comes from elsewhere." It is true that Puerto Rican cuisine is an amalgam of cultural traditions. My friend’s failed reasoning lays in the fact that the same could be said of any culinary tradition, including Italian. Pizza is a variation of a Greek dish, which previously existed in ancient Persia. The invention of pasta is attributed to the Arabs who introduced it to Europe in the 9th century A. D. The traditional sauce used in Italian cooking is made ​​of tomato, a fruit cultivated by the natives of the Americas. So Italian cuisine is an amalgamation of Persian, Arab and Native American traditions, among many others. But that does not make pizza or pasta less Italian, in the same way that plantains being originally from Southeast Asia does not detract from either the Puerto Rican taste of our famous ‘pasteles’ or erase the ‘mancha de plátano’ all of us carry. Science is a humanistic and universal cultural tradition, like music, literature or art. But, like music, the fact that it’s universal does not make it less Puerto Rican. No one refutes the impact of music on our cultural identity, and the impact of our cultural identity on music. Few would argue against the sciences being an integral part of the cultural expression of a people. 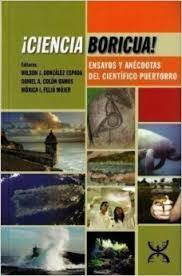 However, Puerto Ricans have not yet envisioned Puerto Rican science as part of our culture. Science belongs, many think, to other parts of the world, not the Puerto Rican archipelago. "Here we have many musicians and artists, but no scientists," someone once told me. This year marks the tenth anniversary of one of the largest virtual scientific communities worldwide, the Ciencia Puerto Rico community. Our scientific community, comprising more than 7,000 members in over 50 countries, is a focal point for the exchange of very Puerto Rican but also very global ideas, as it should be with any healthy and relevant cultural phenomenon. Puerto Rican science encompasses a large group of scientists who come to Puerto Rico from all over the world, who adopt Puerto Rico and contribute their ideas to help build the Puerto Rican scientific tradition. Likewise, local scientists can be found all over the world, and their findings are discussed in university classrooms from Europe to Japan. German science is known to be precise. Science in the United States is known for being innovative and entrepreneurial. What are the features of our emerging Puerto Rican science? Our science has guts. Perhaps because of the lack of recognition and support, Puerto Rican science is resilient, with purpose and determination. Puerto Rican students, coveted by the best universities, carry those characteristics with them and impact the way science is around the world. Puerto Rican science is also generous and collaborative. Our scientists and students, more than anywhere else, seek to share their knowledge, either through science outreach activities, serving others or by developing partnerships. It is no coincidence that this trait that is so ours has resulted in such a dynamic community as Ciencia Puerto Rico. In the same way that German precision benefits all science, not only German science, Puerto Rican generosity also benefits and impacts science globally. For ten years, our community has shared Puerto Rican science with the world and with young people so they can find in it inspiration, and for many, also a calling. Recently The White House recognized this paradigm as innovative and powerful for science education in Hispanic communities. Universities like Yale and countries around the world contact us to replicate our model. And thus, the cultural traits of Puerto Rican science have made an impact worldwide. Puerto Rican author Mayra Santos-Febres once said: "Our stories are not being told. And without our stories, the world is incomplete." In the restless mind of a curious child, questions to which science has yet to obtain an answer always arise. To our Puerto Rican children we should say: "We do not know the answer to that question yet, perhaps because you will be the scientist who will find the answer." And until these discoveries are made and these ideas take shape, which belongs to us as people and a scientific community, the world will remain incomplete. This article originally appeared in El Nuevo Día on February 20, 2016. This article is the first of a series of entries for the blog "Equipo CienciaPR Informa" related to the tenth anniversary of the organization Stay tuned! The author is Associate Professor, Department of Neuroscience and Cell Biology at Yale University and Adjunct Professor of the Institute of Neurobiology at the University of Puerto Rico.